Denying user the ability to register and login via GridGuard is a key component of user security. Ignoring disabled users also allows you to reduce the number GridGuard licenses that are being consumed. This document describes how GridGuard can be configured to ignore disabled users. 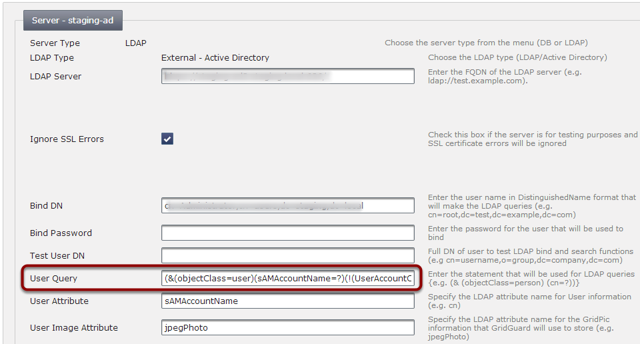 Navigate to the Server Definition object that points to your Active Directory server(s). If you want to remove any existing users that are disabled, run the "Purge Inactive Users" option under "License & User Management" menu. This will remove all users who are missing or disabled in Active Directory.